A few of you have expressed a concern about wearing light colors below the waist, and so for this wardrobe I’m going to avoid that. Also, I’ve been asked to include a maxi skirt in capsule wardrobes, so today I’ve found one! A dark core of four – useful for most of the year, and an essential base upon which we’re going to build this plan. 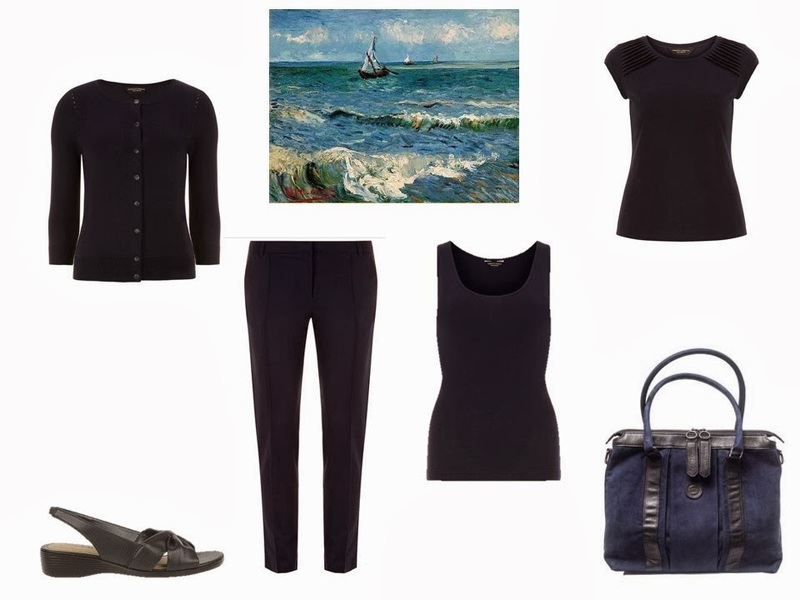 Navy is so perfect for warm weather; if you’re concerned about the colors matching, plan to buy all four items at once, and maybe from the same place. I love the painting! And the seafoam green you selected, Janice! Love this inspiration for colors. Since navy and khaki are my usual summer bottom colors, but I can't use khaki near my face, these suggestions could have been made just for me! Please check on the Dorothy Perkins and Target links which aren't working for me. Funny how we see things differently. Looking at this painting I saw turquoise and blue, you saw a more neutral palette and in fact, that happens a lot with your scarf and painting posts. These posts help me a lot, they're a great way to train my eye to see from a different angle. 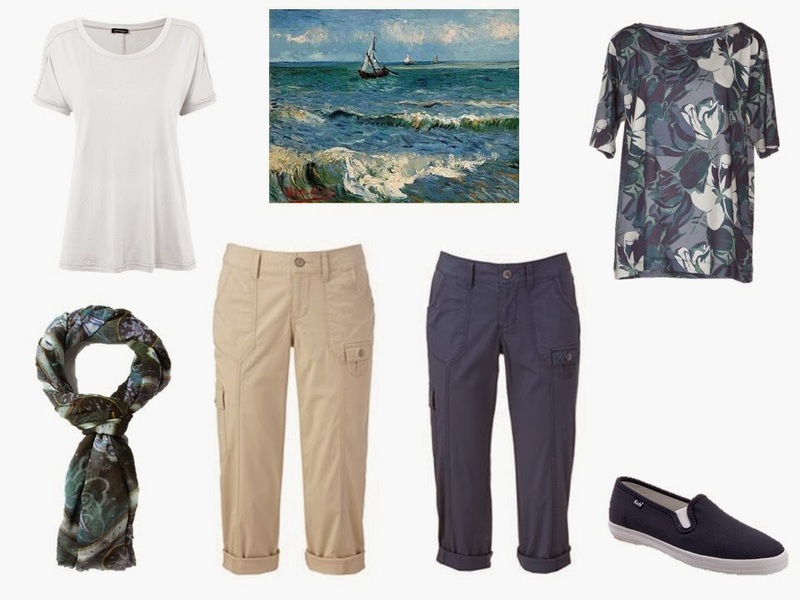 Pretty, practical choices for summer travel or a core summer wardrobe. Thanks, as always, Janice, for thinking of your addicted blogsters even as you are busily off in NYC having a life! Another beautiful array of pieces and outfits. I love this. I've always been a fan of seafoam and navy, and have several pieces similar to the ones you show above. The Van Gogh is absolutely beautiful! What a wonderful seascape. My favorite of all of the paintings you've featured so far. As always, well done, Janet. Janice, thank you for choosing 'my' painting. 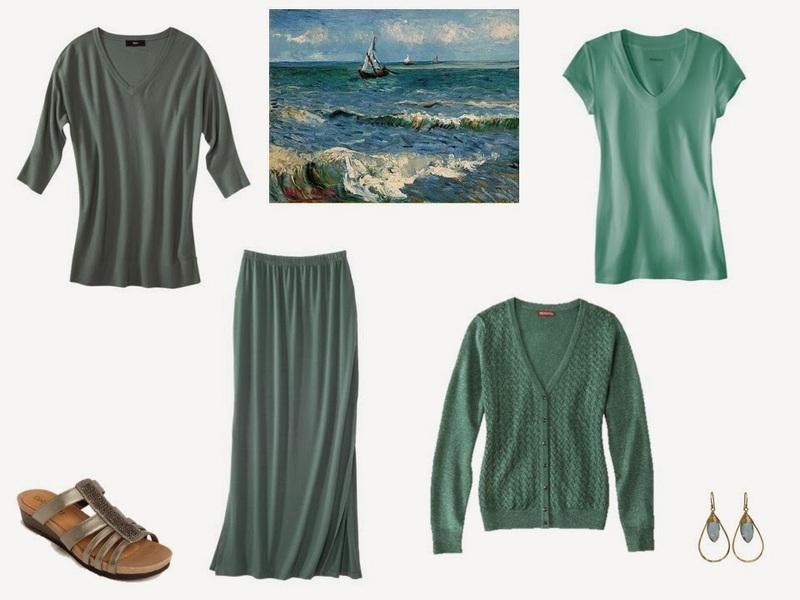 Your suggestions are beautiful – those soft greens and moody greys, I'd just never have thought of these with the navy. I feel inspired. I'm grateful as always for the generosity with which you research and share your own kind of art with us. What great color combinations. I personally think every person looks good in blue and when it leans to turquoise and seafoam colors another dimension is created. As usual, great ideas and inspiration. Hope you are enjoying your trip. I do love green, but I'm more a jade green/ forest green kind of girl.